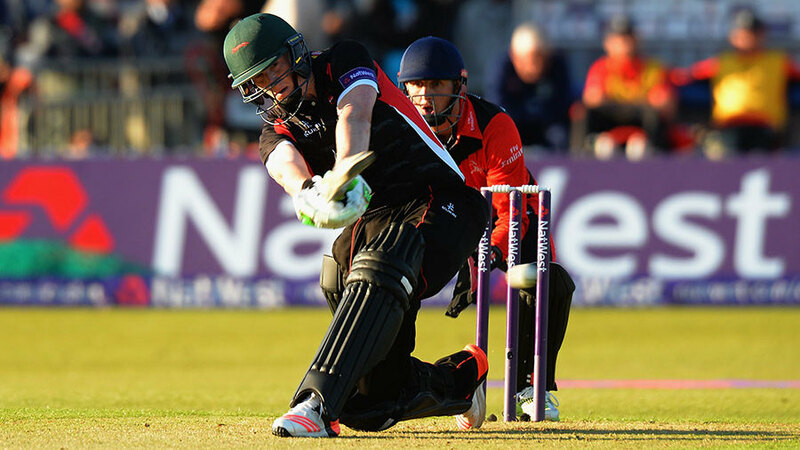 Leicestershire made it consecutive wins in the NatWest T20 North Division as Durham's batsmen struggled to come to terms with a well-grassed but relatively slow pitch at Grace Road. Durham skipper Mark Stoneman's decision to bat first after winning the toss looked like it might pay off when the first over, bowled by part-time offspinner Neil Pinner, yielded 15 runs. But Foxes captain Mark Cosgrove turned to his seamers, and in the third over Stoneman, looking to pull a short delivery from Rob Taylor, bottom edged the ball into his stumps. Calum MacLeod was becoming increasingly frustrated when he stepped across his stumps and attempted to scoop a Kevin O'Brien delivery over the wicketkeeper's head, and succeeded only in edging a simple catch to Ned Eckersley at point. Phil Mustard pulled and square drove boundaries off O'Brien in the 11th over, but in the 12th Paul Collingwood tried to lift the offspin of Jigar Naik over long-off, and was well held by Grant Elliott. The New Zealander then dropped a fierce chance off Mustard, on 41, but the left-hander added only four more runs to his score when he was held by Rob Taylor at long off from the bowling of O'Brien. John Hastings did his best to increase the scoring rate, hitting three beautifully timed boundaries in going to 21 off 13 balls, and together with Gordon Muchall, who made 31 off 27 balls, added 37 for the sixth wicket. A target of just over six an over always looked likely to be inadequate, however, and though Hastings bowled well at Cosgrove when Leicestershire began their innings, youngster Paul Coughlin was lofted high over long-on and into the player's car park by the Australian left-hander. Coughlin got his revenge, catching Cosgrove at deep-extra cover off Usman Arshad, and Scott Borthwick pinned Eckersley leg before wicket so that after ten overs the Foxes were only just ahead of the required rate. Had Borthwick won a stumping decision when Elliott was only 3, matters might have become really interesting, but after several replays, third umpire Tim Robinson decided there was sufficient doubt to reprieve the New Zealander. Salt was rubbed into the wound when Borthwick's next over went for 20, and offspinner Ryan Pringle received similar treatment as Leicestershire cantered home with 27 balls to spare. "I don't think the pitch was too bad at all, I think we bowled pretty well on it, and then the batsmen took us home," Cosgrove said. "It's good to back up on beating Derbyshire in our last match, and hopefully we can take the form into our game at Worcester on Friday night."